Dogs actually need a small amount of vegetables in their diet because they provide a great source of fiber and contain health-protective phytonutrients which are ONLY found in plant material. Since vegetables should only make up a small percentage of a dog's diet, it is important to choose nutrient-dense vegetables like carrots that provide a large amount of nutrients in a small serving. Amazingly, a small amount of the right vegetable in our dogs' meals can play a significant role in helping their bodies function at their best. There are many nutritious vegetables to choose from, but some of them do more than provide healthy nutrients - they actually have healing powers. Root vegetables, like carrots, are especially known for their remarkable healing powers. That's why we call the Carrot - The Root of Nourishment and Healing! Olewo - the ORIGINAL Carrots for Dogs! The Olewo company in Germany was ahead of its time when it developed their first Carrots for Dogs, an all-natural dog food supplement more than 40 years ago when natural foods for pets were not common. Root vegetables are some of the most nutrient-dense vegetables in the world. Because root vegetables grow underground, they absorb a great amount of nutrients from the soil. Since the carrots in Olewo products are grown in Northern Germany, known for its extremely fertile soil, they are super nutritious. At Olewo, they go through great lengths monitoring the carrots in the fields to assure they are harvested at the right time when the nutrient levels are at their peak. Carrots, like all root vegetables, start loosing vitamins and other nutrients as soon as they come out of the ground at harvest and are exposed to light, air, and moisture. Especially with carrots, nutrient loss is a big concern because many of the benefits come from the beta-carotene which is extremely sensitive to light. At Olewo, the carrots go to preparation immediately after harvest to avoid this nutrient loss. Olewo has developed a proprietary preparation method of forming highly nutritious carrots into a pellet structure that ensures maximum capture and preservation of the valuable beta-carotene and other nutrients. Because of the fast diminishing nutrient loss in fresh carrots, your dog will not be able to reap the same health benefits if you were to prepare your own carrots. While cooking carrots increases their digestibility, you are starting off with carrots that have far less nutrients than Olewo Carrots. When you buy fresh carrots at the grocery store, they may not be that fresh after all and more than likely have already lost much of their nutrients depending on when they were harvested, where they were grown, and how long they spent in transportation. In addition, the carrots are sitting under the light in the produce department, contributing to more nutrient loss. You may stand a better chance to get fresher carrots at a local farmers market, but more than likely those carrots also were not just harvested the day before, and they are often sitting in direct sunlight at the farm stand. Unless you grow your own carrots, you will never know how fresh and nutritious the carrots you buy really are. Carrots need to be fed to dogs in the proper form for them to properly digest the vegetable and be able to reap the health benefits. Dogs cannot properly digest raw vegetables! The issue with raw vegetables is that the vitamins and minerals are embedded in cellulose, a carbohydrate that is difficult to digest, and therefore dogs will not be absorbing the valuable nutrients. Most dogs enjoy eating raw carrots, but the chewed pieces simply pass through their digestive system without being broken down, and without the nutrients being absorbed. If you ever take a close look, you can see the carrot pieces in the dog's poop just they way they were swallowed. We still give our dogs raw carrots at times, simply because they enjoy eating them raw, but they receive their Olewo Carrots in their meals every day for the health benefits. Since Olewo Carrots are in the proper form and easy to digest, dogs are able to absorb and utilize the nutrition from this amazing root vegetable to benefit their health. Due to the special preparation method, the nutrients are retained until the carrot pellets are rehydrated with warm water by the pet owner prior to preparing each of their dog's meals. The dehydrated carrot product returns to a fresh food appearance with the a nutritional value that closely resembles the fresh carrots they are made of. Olewo Carrots are very effective because they are highly nutritious, and results can often be seen in just a few days after adding the carrots to a dog’s daily meals. 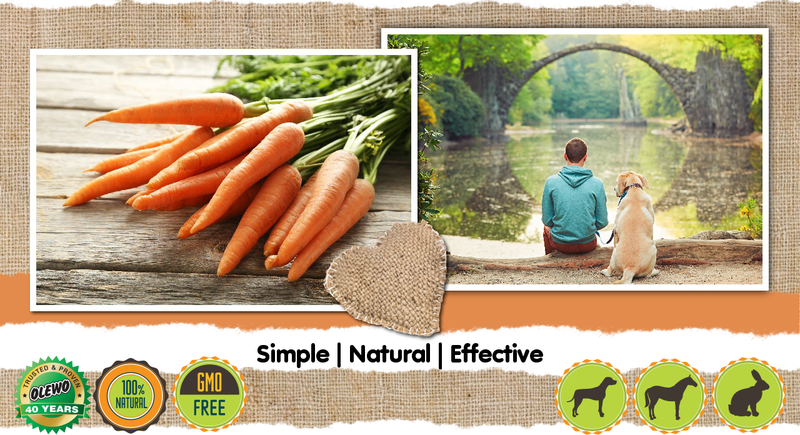 Many dog owners tend to find Olewo Carrots when searching for a natural product to help with dog diarrhea. Typically, after just 2 days of feeding Olewo Carrots, the intestinal lining is calmed, resulting in a quick cure from diarrhea. Continued daily use will help maintain a healthy digestive system and avoid any future bouts of diarrhea and other digestive issues. Gut health is extremely important because it affects your dogs entire body. Typically after just a few weeks, healthier and shiner, smooth and silky coats can be seen, and the overall picture of the dog is healthier. Olewo Carrots also provide long term results that are not as visible, such as increased antioxidant levels and a strong immune system, which also contribute to your dog’s health and help eliminate many of the common ailments in the first place. For complete Description and Uses, please see Olewo Daily Carrots for Dogs. The vitamins and minerals from a whole food like carrots are much more effective than synthetic vitamins. The vitamins in synthetic products loose a large percentage of their potency when separated from its natural whole food family. The natural vitamins from a whole food like Olewo Carrots are groups of related compounds that cluster in the food. They include extra factors like trace minerals, co-enzymes and antioxidants associated with the major vitamins and increase the ability of the vitamin to function. They are complete in the form your dog's body needs them and are easily absorbed. Synthetic vitamins do not include the extra factors, and therefor are not as effective, and can even lead to vitamin overdoses and imbalances in the dog's body chemistry. Kibble is the most highly processed dog food and the ingredients are stripped of their nutritional value. A synthetic vitamin mix of often sprayed on the food afterwards to replace some of the lost nutrients. The addition of Olewo Carrots will significantly increase the nutritional value of the food. Even though wet (canned) food is a better choice than kibble, it is still processed food. Any vegetables that might be in the canned food would have a diminished nutrient content. Mixing in Olewo Carrots will significantly raise the nutritional value of the food. Raw dog food that consists of meat, organ meat, and bones should be supplemented with Olewo Carrots for the added nutrition and healing powers. It wouldn't make sense to feed your dog an all-natural, raw diet and then add synthetic vitamins. Olewo is the perfect partner for raw feeding. When preparing home cooked meals for your dog, it is very important to supplement to make sure the meals are complete with all the vital nutrients. Since you are going through the effort to cook for your dog, it wouldn't make sense to add synthetic vitamins. Olewo Carrots are the perfect partner for supplementing home cooked meals with whole food nutrition. 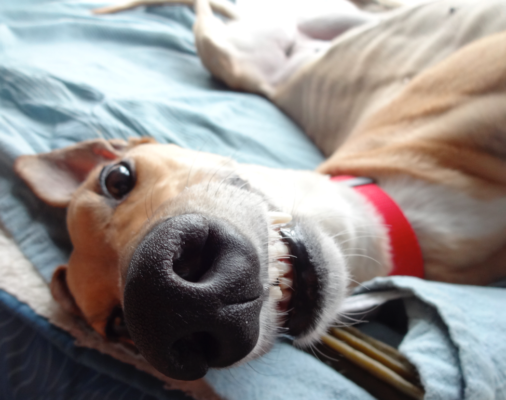 "I discovered Olewo Carrots a few years back after Marker, our retired Greyhound, came down with a severe case of Gastroenteritis, requiring hospitalization to receive meds via IV for several days. When she was released from the vets, she was sent home with a special prescription gastro diet that was supposed to help get her digestion back on track. It was expensive and did nothing to curb the diarrhea. Our pooch was literally painting the sidewalks brown on each walk, it was pretty nasty. We then tried adding (again expensive) prescription probiotics to the food with no avail. While trolling a Greyhound breed specific forum on the subject of dealing with the "Big D", I came across several threads about the wonders of Olewo Carrots. SO I ordered up a bag and was SO glad I did because within 3 days of feeding the carrots there was a BIG improvement in stool quality. Firmed them right up, they could roll down a hill, ha ha! We then continued to supplement her regular diet with Olewo Carrots after her recovery. Not only did it help keep her touchy digestion on track, within weeks we discovered another bonus: the carrots also improved her skin & coat! Even people who pet her always comment on her silky fur, asking "what's your secret?" Well, it's no "secret" that Olewo really works! Thanks for making such a great (and affordable) product"